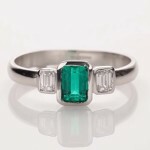 A very fine astrological combination ring comprising of a very fine Em cut Emerald & two Em cut diamonds set in platinum. In applied astrology this unique ring is to enhance the wearer’s beauty, vision, imagination, patience, dealings, salesmanship, diplomacy, male & female health, higher status, prestige, expressive personality, art, craft and skills. It is especially recommended for natives working in finance, accounts, stock & share market, stock broking or dealing, business management, comedian, musician, political advisor and policy maker. The wearer achieves name, fame, establishment, comforts etc and is even more potent if your lagna is Taurus, Gemini, Libra, Capricorn & Aquarius and you are desirous of achieving a good flow of income, wealth, assets, savings, presentation, sales executive, convincing power, health, stability, defence from any crisis, vision, imagination, creativity, activities, common sense, wisdom, decision making strategy, rise in luck, prosperity, luxuries, life styles, rising, spirituality, profession, status, prestige, honour, career, establishment, peace of mind, properties, assets, savings, power in speech, governing power, strength, confidence & establishment.